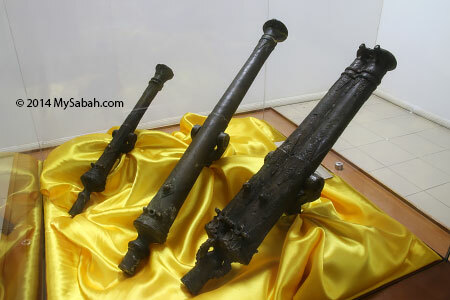 Islam landed on Sabah in 1408, according to a manuscript of Idahan found in Lahad Datu. Borneo was ruled by Brunei and Sulu, the Islamic empires, so Islam plays an important part in Sabah history. Even today it also influences every aspects of our culture and living, as 61.4% or 1,062,280 of Sabah population are Muslims (Census 1991). 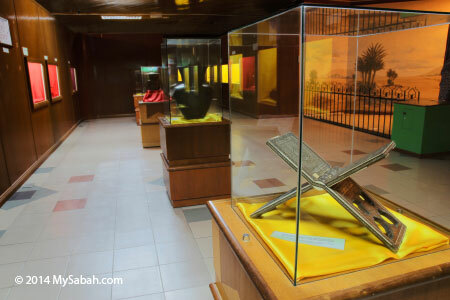 Sabah Islamic Civilisation Museum (Local Name: Muzium Tamadun Islam Sabah) is only 15 minutes walk away from Sabah State Museum, and you can enter it for free on the same day, with the same ticket you visit Sabah Museum. 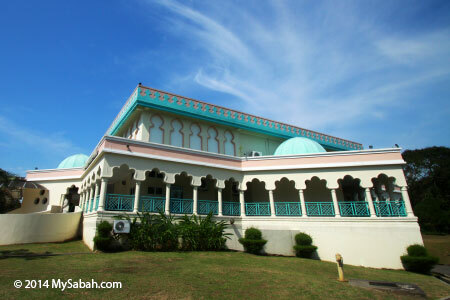 Sabah Islamic Civilisation Museum is a 2-storey building that requires only 1 or 2 hours to tour around. The five domes of this museum represent Five Pillars of Islam, the five basic acts in Islam which form the foundation of Muslim life. This museum looks like a beautiful mosque by itself. 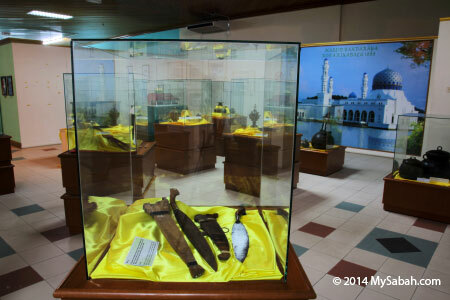 In ground floor, the first gallery you will see is about the past and present of Islamic world. Most tourists skip this museum so it is very quiet. 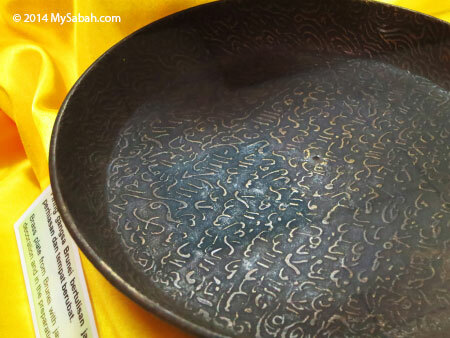 Though I’m a non-Muslim who can’t read Jawi, I admire the elegant Jawi words engraved on the items. You can tell that the devotion to Allah is not only in the heart of Muslims, and also reflected in their daily lives. 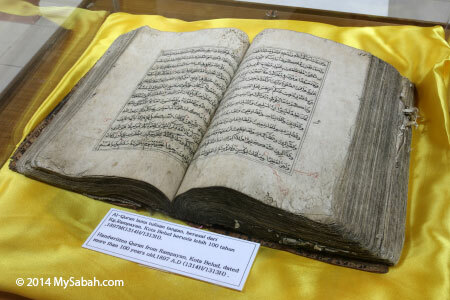 Many Islamic artefacts are being displayed there, most of them are hundreds-year old items from Middle East countries such as Turkey, Egypt, Persia, Morocco, Iran and India. I list some of them here. 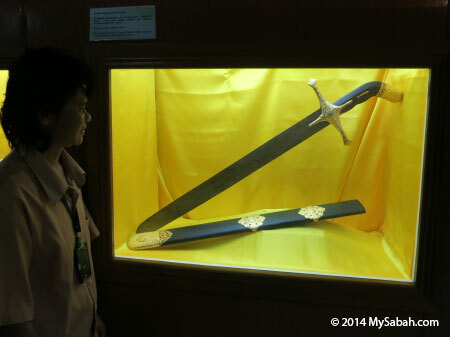 Pic: replica of Saidina Uthman bin Affan III sword. It’s too big (and precious) as a weapon. It’s for use in dance performance. 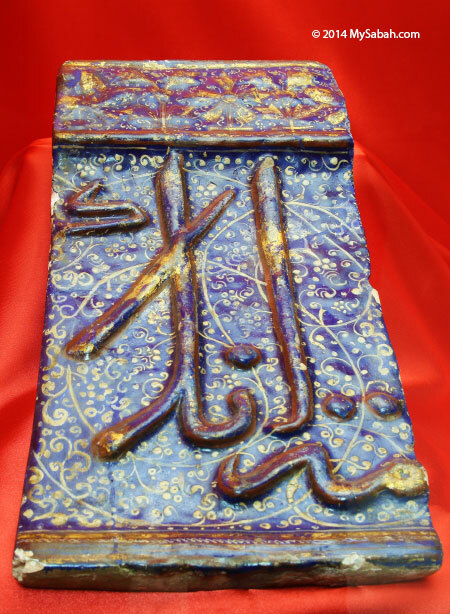 Pic: these are interesting Chinese incense burners from late 19th century, with Quran verses on them. FYI, there are more Chinese Muslims than Malaysian Muslims on earth. Islam is a religion for the world, not to any particular race. 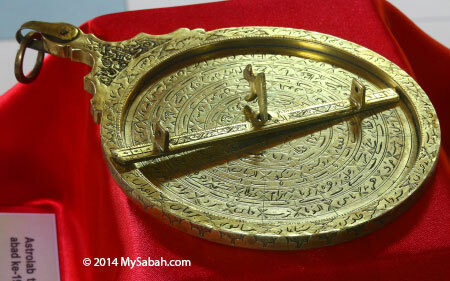 Pic: 19th century brass astrolabe from Persia. Muslims are already very advanced in astronomy during early civilisation. Pic: this thing is like “laptop computer” of 19th century. 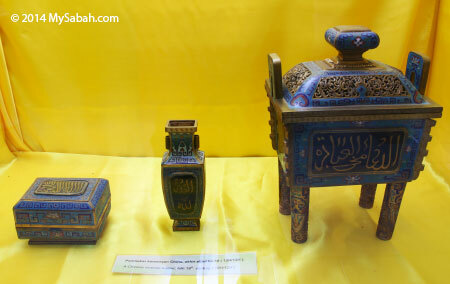 They are small pen box from Qalahdan Teheran Persia (left) and Indo-Persian damascened travelling scribe’s set comprising an inkwell, pen holder and candle-stand (right). 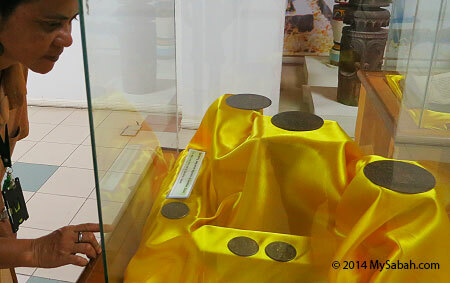 Other artefacts that are on display are antique boxes, jars, Quran books, musical instruments, weapons, bowl, etc. The gallery also briefly introduces The Organisation of Islamic Countries (OIC) and its roles in today’s world. 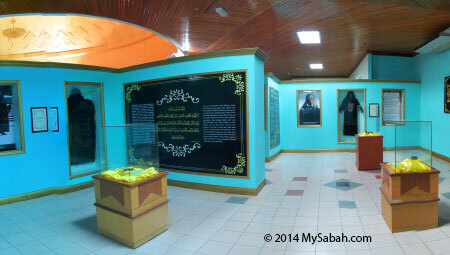 This gallery is the highlight of Sabah Islamic Civilisation Museum. Betel chewing can date back to 3,000 BC and its function is similar to chewing tobacco today (but with more kick). To prepare for the chewing, the chewers need to cut the areca nut, add it with sirih leaf, lime and sometimes gambier paste. They would store these ingredients and cutting tool in a container (known as Celapa locally) that they can carry around, to enjoy betel chewing anytime. 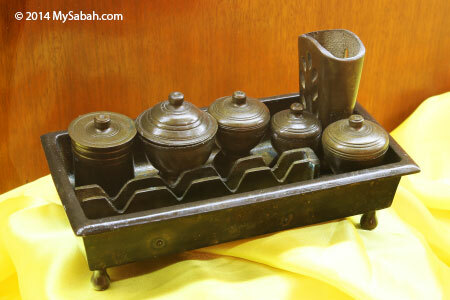 Pic: A wooden betel-nut box engraved with silver along with four silver made betel nut boxes. The cap is decorated with gold plated carving. 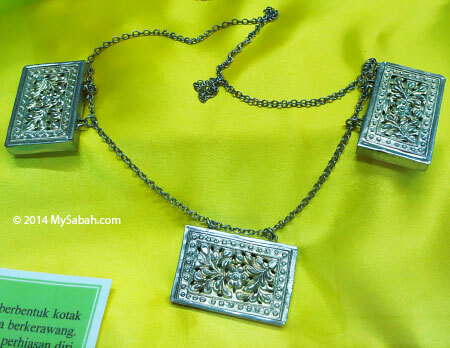 Usually used by the royal family from Sambas, West Kalimantan, Indonesia. Betel was used as a social denominator among royalty, and king was attended by “betel slave” to carry the set for preparation of betel chewing. Elaborate betel set owned by royalty is made of the finest materials available, often gold or silver and inlaid with precious stones, and it is also exchanged as gifts between foreign rulers. Many Sabah indigenous people still chew betel nut nowadays. They also like to encourage tourists to give it a try. To first-timers, betel nut tastes hot and bitter, so they would spit it out, giving our locals a good laugh. 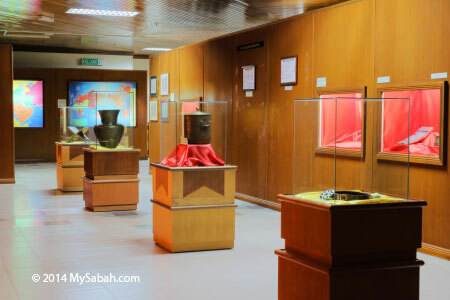 The gallery of Islamic Museum has very nice collection of betel nut containers from Sabah, Sarawak, Brunei, Kalimantan, Kelantan and Philippines in various materials (e.g. 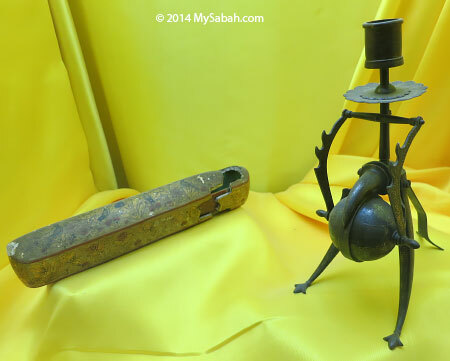 wood, brass, silver and gold), shapes, sizes and design. A basic betel set includes a tray, individual containers (storage for items such as areca nut, betel leaf, lime and gambier), and a tool for cutting the nut. The material and workmanship of a set can vary from simple to complex. Betel nut is commonly included as part of the offering in animistic worship, to communicate with supernatural force or cure sickness. The Betel Nut container is also presented as a symbolic gift for dowry. 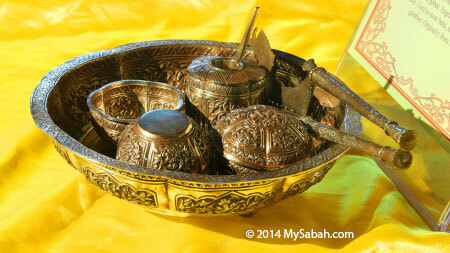 Pic: silver round-shaped betel nut set from Sarawak, engraved with floral vine motif, with four small boxes and a gobek. 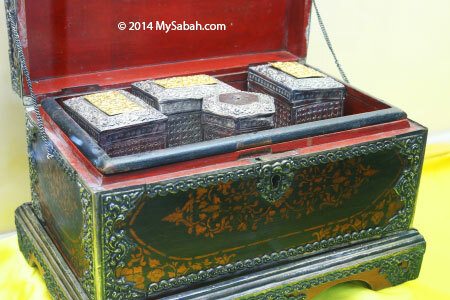 Ornamental gold betel box is among of 7 articles that required in installation ceremony for Sultan of Terengganu. It has become an important cultural heritage. 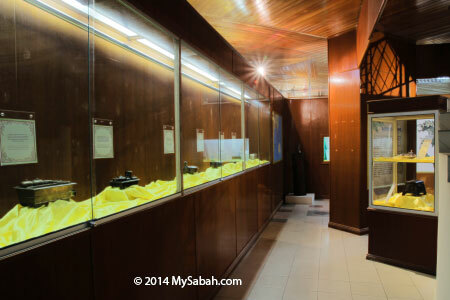 There are dozens of Islamic antique in “Sabah Gallery” on first floor. 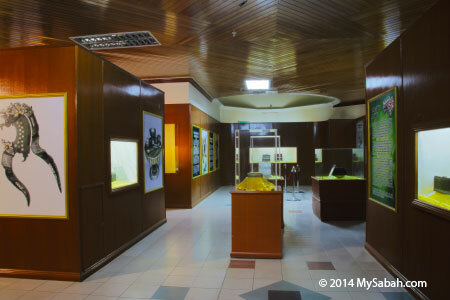 Besides items from Sabah, I also found a lot of artefacts from Brunei and Sarawak so I call it Borneo Gallery. Many more unique pieces are shown there. By looking at those old-day daily items such as kettle, measurement tools, containers, plates, swords, pots and vase, you could imagine how our Muslim ancestors lived. Muslim costumes are very commonly worn in Malaysia. However, very few non-Muslims understand the meaning behind the attires. 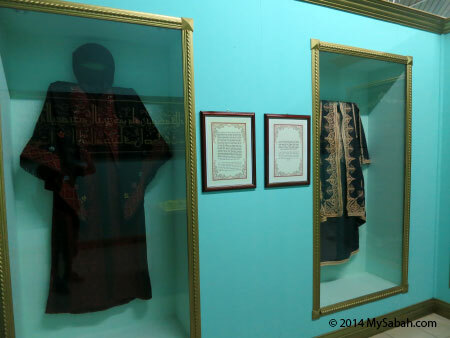 This gallery also displays many hand-embroidered cloth and robes from other Islam countries such as Jordan, Turkey, Iran, Arab and Dubai. Besides clothing, you can see other adornments and accessories worn by Muslims such as belt, pin, necklace, pendant, buckle and bracelet. There is a section that introduces the development of Muslim in Sabah in the past, with some info & photographs of Sabah mosques. 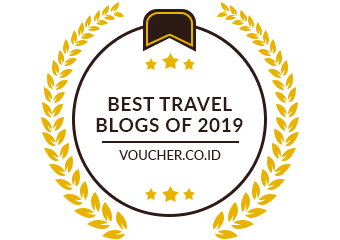 It also talks about Islamic laws, important local Muslim figures and events, Zakat law (giving 2.5% of own savings to the poor and needy) and Ulama (Muslim legal scholar). But most of the information is in Malay language and not translated to English. If you are interested in mosques of Sabah, you may visit Sabah State Mosque and KK City Mosque in Kota Kinabalu, both are famous attractions. But please don’t visit on Friday (day of worship). 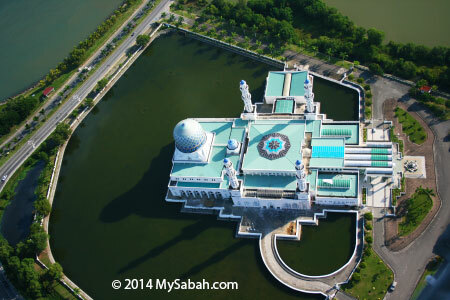 Built in 1977, the grand dome of Sabah State Mosque is one of the biggest domes in the world with a height of 132 feet and 70 feet in diameter. One of the most beautiful and unique features of this mosque is the high quality calligraphic writings found on every dome. Situated on a man-made lagoon, the architecture of City Mosque is inspired by Nabawi Mosque in Medina. 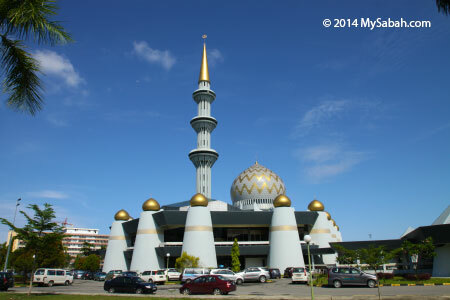 It is the largest mosque in Kota Kinabalu and one of the most beautiful mosques of Malaysia. 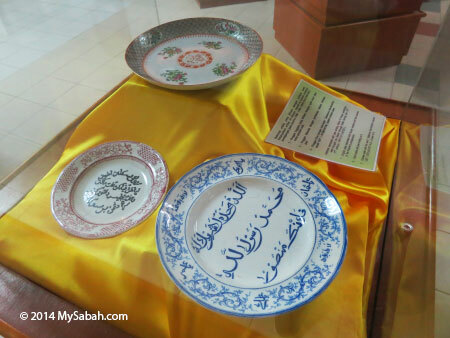 Note: If you have bought the ticket to visit Sabah State Museum, you can enter Sabah Islamic Museum with the same ticket on the same day for free (which means you don’t need to buy another ticket).